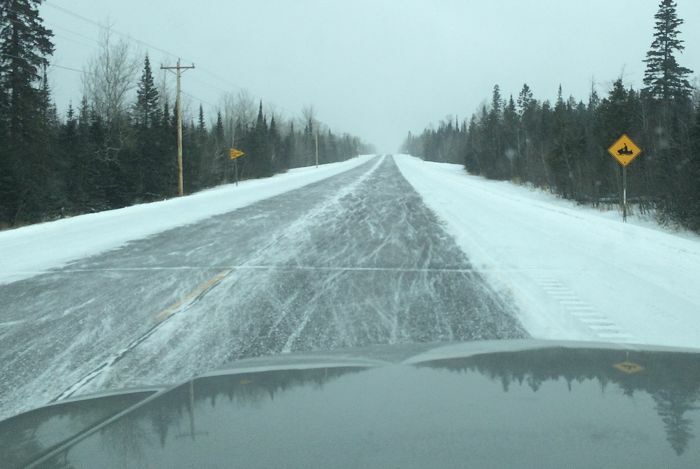 Driving the half dozen miles up "the hill" from the town of Two Harbors, the familiar increase of snow in this area confirmed the reports I'd gotten that the snowmobiling was decent and that the C.J. Ramstad Memorial North Shore trail had been groomed. For the umpteenth time during my life as a snowmobiler, I felt grateful for living only a few hours drive from this paradise that gets that little extra bit of lake effect snow. Cal and I were onto the trail in no time, with plans of riding north, finding a motel for the night and then returning to the truck the next day. We discovered a perfectly groomed trail, with plenty of snow. There were a few corners where we'd hear a rock ping off of a carbide runner, but there were very few turns that showed even a skiff of dirt. Most corners had the half-foot of base needed for sweet carving. 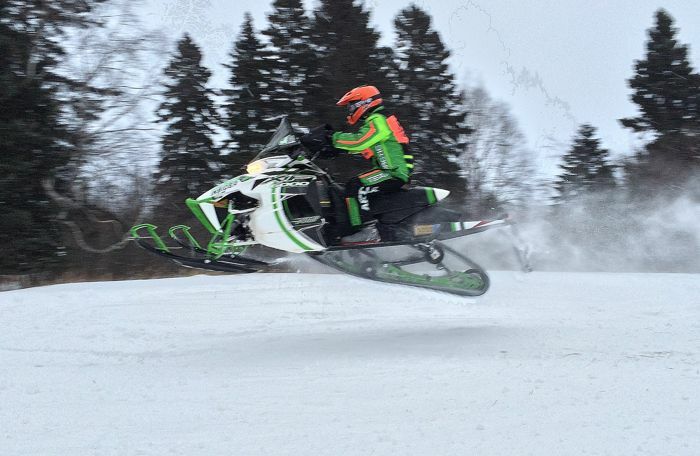 Cal and I kept switching back and forth between our Sno Pro 500 and the new XF 6000 Sno Pro. 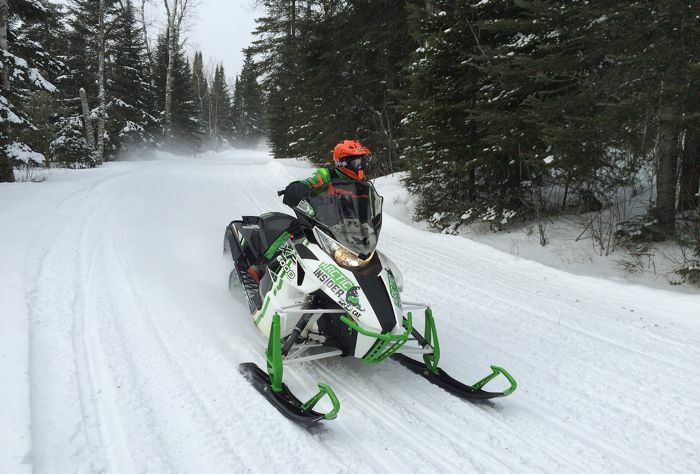 Cal likes the comfort and power of the XF, but he loves the playfulness of the Sno Pro. Our Sno Pro still had some pretty fresh Stud Boy Shaper bars on the skis, while the XF had pretty worn, stock dual-carbide runners. 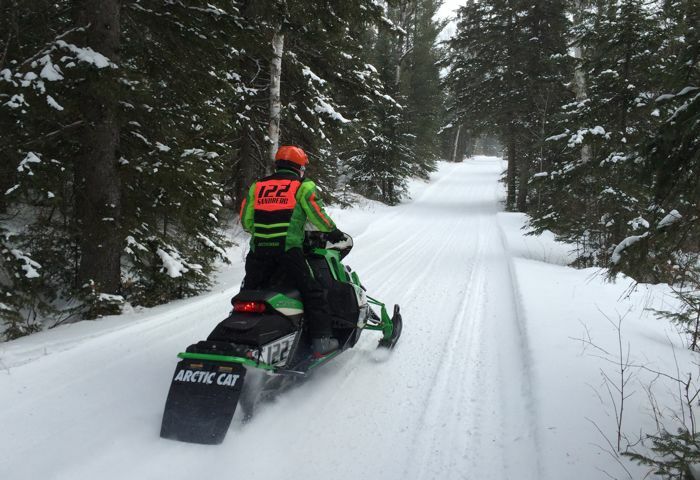 The Sno Pro carved like the race sled that he's accustomed to, whereas the XF needed the coaxing of brakes to keep the front planted on what was hard-packed, very cold snow. We stopped at the legendary Trestle Inn, about 75 miles into the trip. If you've read this site for a few years, perhaps you recognize this place (and the North Shore Trail) as a familiar stop during our annual Last Ride of the Season. This was Cal's first trip to the Trestle and, no surprise, he loved the place and the 1/2-lb. hamburgers they're famous for. There were maybe 15 sleds parked here. 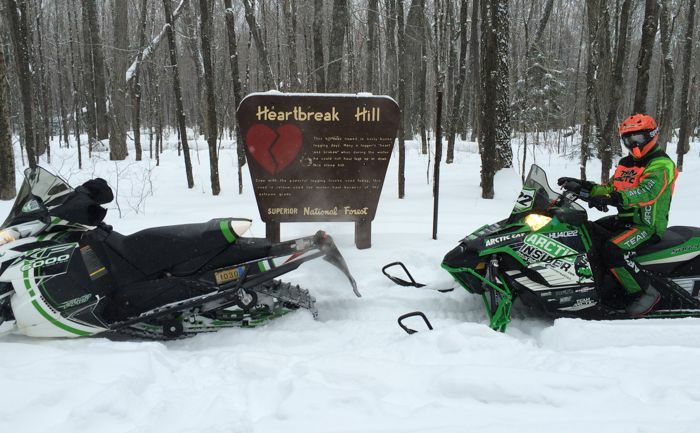 And we probably saw another 30 sleds during the day. But considering that very little of the state has rideable snow and that this was a 3-day weekend for a lot of people, I was surprised there weren't more people riding. Cal and I did a little off-trail exploring around the Tofte area, following some unplowed logging roads and such. 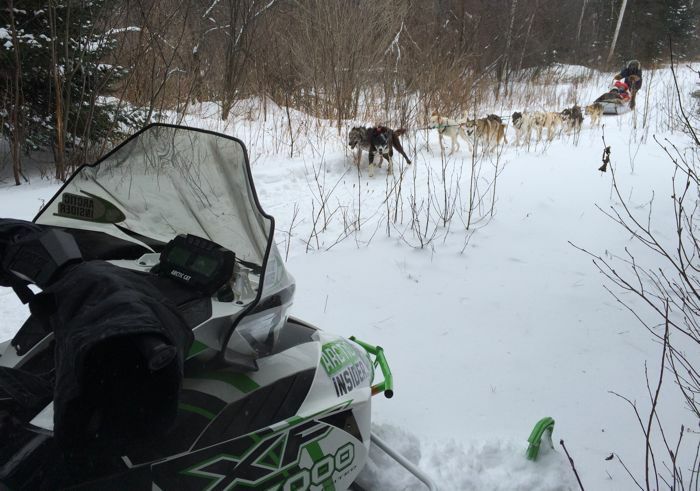 Out in the bush, we came across a dog sled team who were aiming for the same kind of adventure. We peeled to the side of the trail, shut off our engines and exchanged greetings with the people when they came by. Two different kinds of winter lovers making the most of what nature provides. All good and friendly. 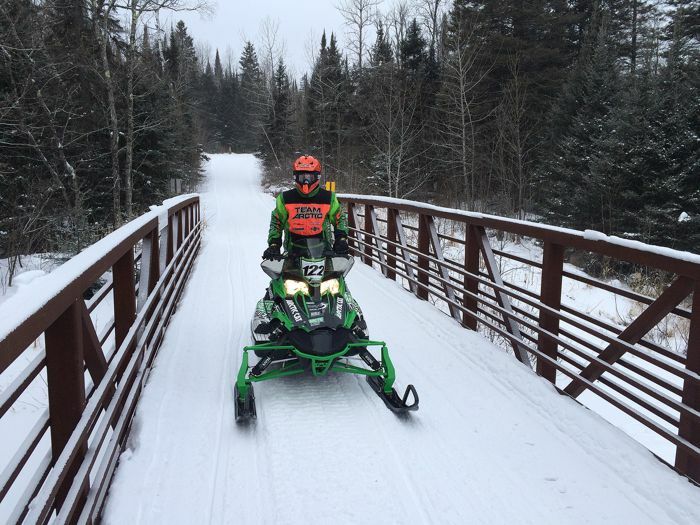 We decided to find a motel in the town of Tofte and, on the trail into town, came a section of powerline in which there were some off-trail jumps. Of course Cal wanted to hit them, so we stopped for 15 minutes while he played. I've come to realize that Cal prefers this kind of play riding and jumping to simply logging miles on a groomed trail. "Trails are too smooth," were his words when I asked him about it. 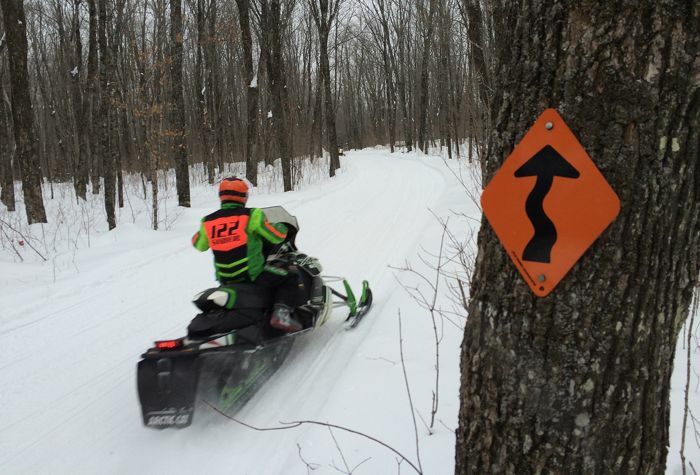 Over the years I've noticed in many areas of the midwest trail system where sledders find an adjacent area with terrain features, then go bust drifts and/or play and jump and such. This is a problem of course in areas where such playing occurs on (someone else's) private property, where such freelance riding opens up a huge can of worms. I don't allow Cal to ride in such areas where it's apparent that such riding is a no-no. But in an area like this powerline section in the photo, I give him the nod to play around. I believe that a lot of young riders are like Cal and would prefer to ride in a generally small area, but that has jumps and hills and such. In a way, a Midwestern version of riding in the mountains. I sometimes wonder if the future of our sport might include terrain parks that are just for such riding? ...after Cal did his jump session, we got a room at the Americinn in Tofte, went back out for another 40 mile loop, then returned for dinner and a good night's sleep. On our way back towards the truck the next morning, we stopped at the site of a failed romance that I suffered through back in High School, and that's memorialized with a sign. Not sure if I like the fact that my personal life is laid bare for anyone passing by this spot, but it's something I've learned to live with. For sure it's easier than dealing with the horrible heartbreak from that relationship. This sign aptly describes much of the North Shore trail. We did a little more off-trail exploration, exploring a couple of the small rivers. It's funny, but this is the kind of riding that most appeals to me, but it does very little for Cal. I think he's always too nervous that we'll get crazy-stuck or lost or in some predicament. It's never happened, but I think it's his fear nonetheless. One last parting shot to illustrate how great the riding was. We logged exactly 200 miles during the two days, riding liesurely and taking several stops for me to shoot pix. The riding in this area is excellent and worth the drive if you're considering it. I've heard the same is true for the northern Iron Range area of Minnesota. Cal and I were thrilled to made the trip, as it reignited our desire for riding during a winter that has otherwise been pretty dismal. It never ceases to amaze me how quickly spirits change from gloom to glee with just a shot of rideable snow. In this sport, snow is everything. Sleds loaded, the truck warm and headed back home, Cal gave me a good 15 minutes of conversation before he turned his attention to more pressing matters. We had found winter. And, along with it, the joy of the season. Your site is the best and this article could not have come at a better time! Six of us have hotel reservations to run that very trail out of Two Harbors this weekend and we were concerned about the trail conditions. Not any more, thanks to you! We were contemplating cancelling the trip because the recorded message today says the trails are fair to good. Well your pics look awesome to awesome, so off we go on Friday! Thanks again, and I will share this article with the other five guys right now. Later! I'm so stoked I just sharted! Great stuff as always John! Dad and I have had many such adventures over the years, many of them on those same trails. Hope to see you and sleepy next weekend TRF! The trails are too smooth....yup Cal is a true cross-country racer! I usually feel the same. Of course I'll be complaining that the course is too rough next weekend too. I like that you stopped and shut off your machines for the dog sledders. That kind of stuff gos a long way in keeping the peace between our two sports. Great article John. Great story on so many levels.... Especially the quality time with someone and mileage part. So many riders I know, would scoff at 200 miles in two days. If you're not knocking out 200-250 mile days, you're loafing. They sort of remind me of touring motorcycle guys. I've had some of my best days, be less than 100 miles with family or friends. I'm missing my '10 SP500, so I'm going to Snow Check, a '16 ZR4000RR! We were up there this week too and had some of the same opinions of the good trails, good snow and some great fun with friends. 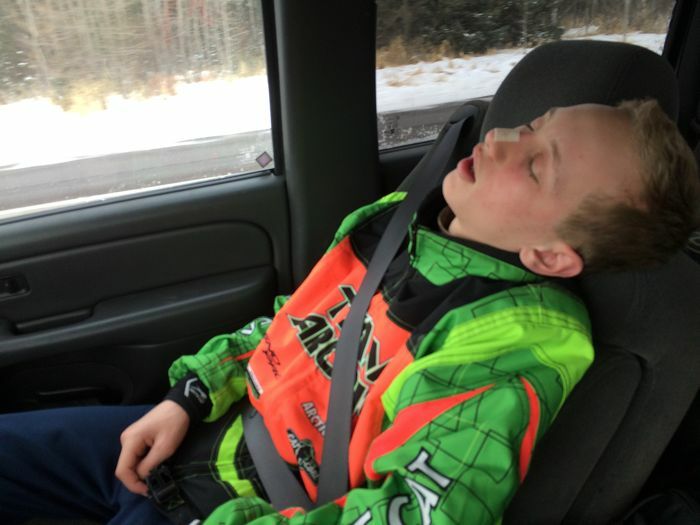 The guy that was a passenger in Paul Heins truck kept falling asleep on the way home after the ride too. Nice story John... it reminds me a lot of the trips I used to love so much as a kid. 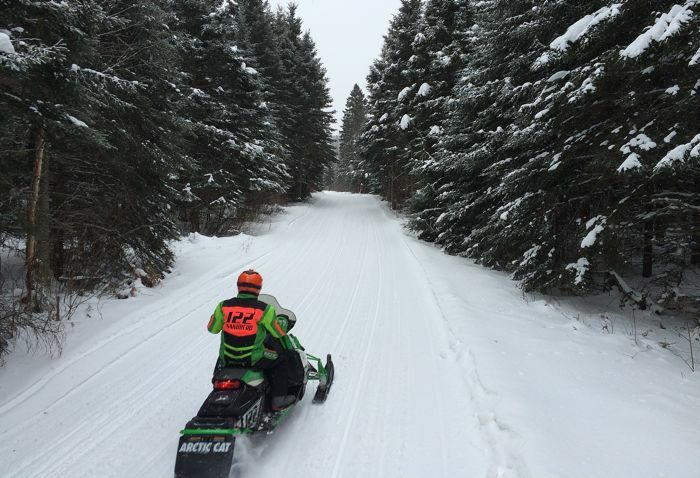 Each winter my parents would let me take a Thursday (and sometimes Friday) off of school to ride from our home in Milaca, MN up to Moose Lake, MN and back. Usually it was just my dad and I, and sometimes my Mom came along too. It was always a great source of memories, and playing hooky from school never hurt either! It's pretty awesome that you take Cal on adventures like this one. Thanks for sharing! As always, thanks for sharing part of your personal life with us. It reminds me of when my son was younger and we'd chase the snow during school break if there wasn't any locally. Now he's either in Fl in college or in GA doing his co-op.... miss him as a riding buddy. But he's doing what he needs to for his future and I have the memories of our adventures together when he was young. Best of times for sure !! A couple of us where to go up Sunday for the day to ride but plans changed and now as I type we are in Orr until Monday and trails are nice.I enjoy your stories about your rides and your son John,my son is 9 and soon to be 10 and can't wait until he is 11 to get his snowmobile permit so I can show him the trails.Thanks for sharing your time riding with your son John. We were up there a few weeks ago. I was amused to find a arctic insider sticker in the men's room at the trestle. Thanks for all of these cool comments you guys, I appreciate it. 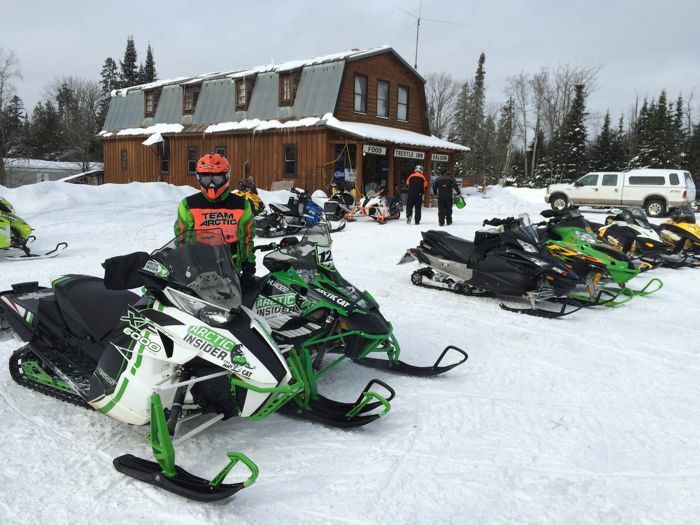 Great to hear about other people finding snow, as well as the shared experience of enjoying snowmobiling with your kids. I used to worry about the transition from big-mile days with friends to more relaxed riding with my son...all for not though, as the time spent with him is the best of all. Flintstone: Hahaha, my advertising program continues to produce big results, as I'm sure you fired up this site as soon as you saw the decal. Right? John: going next wed-Thursday... Which hotel in tofte, does a guy have to make reservations? Or can you just wing it up there. We never really know where we are going to end up. Where did you start at in two harbors? Flintstone: We stayed at the AmericInn, without a reservation. It's a nice place, with a hot tub. We started in the DNR parking lot that's about 6 miles north of town, on Hwy 15/2 (turn north at the Holiday station store). John, As usual, your stories are so well-written and captivating. Thanks again for gracing us with your literary talents! My son is 8, and I can't wait 'til he is old enough to get on a full-sized sled (we have a 120 for him now) and log some miles with me. Love your site. Keep up the great work! We just ran up to the Tresle and back (Friday Feb 27th). 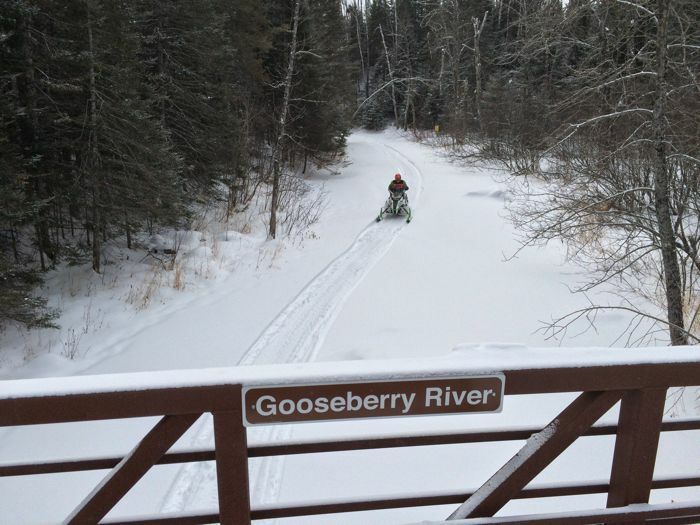 Considering the lack of snow in MN this winter, the trails were very sufficient for the six of us to have a very good time. Just wanted to say thanks again for this article. Gonna run some other trails tomorrow. Also, I noticed somebody put an Arctic Insider sticker on the hand sanitizer of the parking lot restroom.